This article is about Modern Standard Hindi. For other uses, see Hindi (disambiguation). Hindi (Devanagari: हिन्दी, IAST: Hindī), or Modern Standard Hindi (Devanagari: मानक हिन्दी, IAST: Mānak Hindī) is a standardised and Sanskritised register of the Hindustani language. Hindi, written in the Devanagari script, is one of the official languages of India, along with the English language. It is one of the 22 scheduled languages of the Republic of India. However, it is not the national language of India because no language was given such a status in the Indian constitution. Hindi is the lingua franca of the Hindi belt, and to a lesser extent other parts of India (usually in a simplified or pidginized variety such as Bazaar Hindustani or Haflong Hindi). Outside India, several other languages are recognized officially as "Hindi" but do not refer to the Standard Hindi language described here and instead descend from other dialects of Hindustani, such as Awadhi and Bhojpuri. Such languages include Fiji Hindi, which is official in Fiji, and Caribbean Hindustani, which is a recognized language in Trinidad and Tobago, Guyana, and Suriname. Apart from specialized vocabulary, spoken Hindi is mutually intelligible with Urdu, another recognized register of Hindustani. As a linguistic variety, Hindi is the fourth most-spoken first language in the world, after Mandarin, Spanish and English. Alongside Urdu as Hindustani, it is the third most-spoken language in the world, after Mandarin and English. The term Hindī originally was used to refer to inhabitants of the region east of the Indus. It was borrowed from Classical Persian Hindī (Iranian Persian Hendi), meaning "Indian", from the proper noun Hind "India". The name Hindavī was used by Amir Khusrow in his poetry. Like other Indo-Aryan languages, Hindi is a direct descendant of an early form of Vedic Sanskrit, through Sauraseni Prakrit and Śauraseni Apabhraṃśa (from Sanskrit apabhraṃśa "corrupted"), which emerged in the 7th century A.D.
Modern Standard Hindi is based on the Khariboli dialect, the vernacular of Delhi and the surrounding region, which came to replace earlier prestige dialects such as Awadhi, Maithili (sometimes regarded as separate from the Hindi dialect continuum) and Braj. Urdu – another form of Hindustani – acquired linguistic prestige in the later Mughal period (1800s), and underwent significant Persian influence. Modern Hindi and its literary tradition evolved towards the end of the 18th century. However, modern Hindi's earlier literary stages before standardization can be traced to the 16th century. In the late 19th century, a movement to further develop Hindi as a standardised form of Hindustani separate from Urdu took form. In 1881, Bihar accepted Hindi as its sole official language, replacing Urdu, and thus became the first state of India to adopt Hindi. Modern Standard Hindi is one of the youngest Indian languages in this regard. On 14 September 1949, the Constituent Assembly of India adopted Hindi written in the Devanagari script as the official language of the Republic of India replacing Urdu's previous usage in British India. To this end, several stalwarts rallied and lobbied pan-India in favor of Hindi, most notably Beohar Rajendra Simha along with Hazari Prasad Dwivedi, Kaka Kalelkar, Maithili Sharan Gupt and Seth Govind Das who even debated in Parliament on this issue. As such, on the 50th birthday of Beohar Rajendra Simha on 14 September 1949, the efforts came to fruition following the adoption of Hindi as the official language. Now, it is celebrated as Hindi Day. In Northeast India a pidgin known as Haflong Hindi has developed as a lingua franca for various tribes in Assam that speak other languages natively. In Arunachal Pradesh, Hindi emerged as a lingua franca among locals who speak over 50 dialects natively. It was envisioned that Hindi would become the sole working language of the Union Government by 1965 (per directives in Article 344 (2) and Article 351), with state governments being free to function in the language of their own choice. However, widespread resistance to the imposition of Hindi on non-native speakers, especially in South India (such as the those in Tamil Nadu) led to the passage of the Official Languages Act of 1963, which provided for the continued use of English indefinitely for all official purposes, although the constitutional directive for the Union Government to encourage the spread of Hindi was retained and has strongly influenced its policies. Article 344 (2b) stipulates that official language commission shall be constituted every ten years to recommend steps for progressive use of Hindi language and imposing restrictions on the use of the English language by the union government. In practice, the official language commissions are constantly endeavouring to promote Hindi but not imposing restrictions on English in official use by the union government. At the state level, Hindi is the official language of the following Indian states: Bihar, Chhattisgarh, Haryana, Himachal Pradesh, Jharkhand, Madhya Pradesh, Mizoram, Rajasthan, Uttar Pradesh, Uttarakhand and West Bengal. Each may also designate a "co-official language"; in Uttar Pradesh, for instance, depending on the political formation in power, this language is generally Urdu. Similarly, Hindi is accorded the status of official language in the following Union Territories: Andaman & Nicobar Islands, Chandigarh, Dadra & Nagar Haveli, Daman & Diu, National Capital Territory. National language status for Hindi is a long-debated theme. In 2010, the Gujarat High Court clarified that Hindi is not the national language of India because the constitution does not mention it as such. Outside Asia, the Awadhi language (A Hindi dialect) with influence from Bhojpuri, Bihari languages, Fijian and English is spoken in Fiji. It is an official language in Fiji as per the 1997 Constitution of Fiji, where it referred to it as "Hindustani", however in the 2013 Constitution of Fiji, it is simply called "Fiji Hindi". It is spoken by 380,000 people in Fiji. Hindi is also spoken by a large population of Madheshis (people having roots in north-India but have migrated to Nepal over hundreds of years) of Nepal. Hindi is quite easy to understand for some Pakistanis, who speak Urdu, which, like Hindi, is part of Hindustani. Apart from this, Hindi is spoken by the large Indian diaspora which hails from, or has its origin from the "Hindi Belt" of India. A substantially large North Indian diaspora lives in countries like the United States of America, the United Kingdom, the United Arab Emirates, Trinidad and Tobago, Guyana, Suriname, South Africa, Fiji and Mauritius, where it is natively spoken at home and among their own Hindustani-speaking communities. 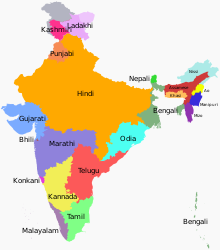 Outside India, Hindi speakers are 8 million in Nepal; 863,077 in United States of America; 450,170 in Mauritius; 380,000 in Fiji; 250,292 in South Africa; 150,000 in Suriname; 100,000 in Uganda; 45,800 in United Kingdom; 20,000 in New Zealand; 20,000 in Germany; 16,000 in Trinidad and Tobago; 3,000 in Singapore. Linguistically, Hindi and Urdu are two registers of the same language and are mutually intelligible. Hindi is written in the Devanagari script and uses more Sanskrit words, whereas Urdu is written in the Perso-Arabic script and uses more Arabic and Persian words. Hindi is the most commonly used official language in India. Urdu is the national language and lingua franca of Pakistan and is one of 22 official languages of India. The splitting of Hindi and Urdu into separate languages is largely motivated by politics, namely the Indo-Pakistani rivalry. Hindi is written in the Devanagari script, an abugida. Devanagari consists of 11 vowels and 33 consonants and is written from left to right. Unlike for Sanskrit, Devanagari is not entirely phonetic for Hindi, especially failing to mark schwa dropping in spoken Standard Hindi. The Government of India uses Hunterian transliteration as its official system of writing Hindi in the Latin script. Various other systems also exist, such as IAST, ITRANS and ISO 15919. Tadbhav (तद्भव "born of that") words: These are native Hindi words derived from Sanskrit after undergoing phonological rules (e.g. Sanskrit कर्म karma, "deed" becomes Sauraseni Prakrit कम्म kamma, and eventually Hindi काम kām, "work") and are spelled differently from Sanskrit. Deshaj (देशज) words: These are words that were not borrowings but do not derive from attested Indo-Aryan words either. Belonging to this category are onomatopoetic words or ones borrowed from local non-Indo-Aryan languages. Hindi also makes extensive use of loan translation (calqueing) and occasionally phono-semantic matching of English. Hindi has naturally inherited a large portion of its vocabulary from Śaurasenī Prākṛt, in the form of tadbhava words. This process usually involves compensatory lengthening of vowels preceding consonant clusters in Prakrit, e.g. Sanskrit tīkṣṇa > Prakrit tikkha > Hindi tīkhā. Hindi also features significant Persian influence, standardised from spoken Hindustani. [page needed] Early borrowings, beginning in the mid-12th century, were specific to Islam (e.g. Muhammad, islām) and so Persian was simply an intermediary for Arabic. Later, under the Delhi Sultanate and Mughal Empire, Persian became the primary administrative language in the Hindi heartland. Persian borrowings reached a heyday in the 17th century, pervading all aspects of life. Even grammatical constructs, namely the izafat, were assimilated into Hindi. Post-Partition the Indian government advocated for a policy of Sanskritization leading to a marginalization of the Persian element in Hindi. However, many Persian words (e.g. muśkil "difficult", bas "enough", havā "air", x(a)yāl "thought") have remained entrenched in Modern Standard Hindi, and a larger amount are still used in Urdu poetry written in the Devanagari script. Medieval Hindi literature is marked by the influence of Bhakti movement and the composition of long, epic poems. It was primarily written in other varieties of Hindi, particularly Avadhi and Braj Bhasha, but to a degree also in Khariboli, the basis for Modern Standard Hindi. During the British Raj, Hindustani became the prestige dialect. Chandrakanta, written by Devaki Nandan Khatri in 1888, is considered the first authentic work of prose in modern Hindi. The person who brought realism in the Hindi prose literature was Munshi Premchand, who is considered as the most revered figure in the world of Hindi fiction and progressive movement. Literary, or Sāhityik, Hindi was popularised by the writings of Swami Dayananda Saraswati, Bhartendu Harishchandra and others. The rising numbers of newspapers and magazines made Hindustani popular with the educated people. The Dvivedī Yug ("Age of Dwivedi") in Hindi literature lasted from 1900 to 1918. It is named after Mahavir Prasad Dwivedi, who played a major role in establishing Modern Standard Hindi in poetry and broadening the acceptable subjects of Hindi poetry from the traditional ones of religion and romantic love. In the 20th century, Hindi literature saw a romantic upsurge. This is known as Chāyāvād (shadow-ism) and the literary figures belonging to this school are known as Chāyāvādī. Jaishankar Prasad, Suryakant Tripathi 'Nirala', Mahadevi Varma and Sumitranandan Pant, are the four major Chāyāvādī poets. The Hindi Wikipedia was the first Indic-language wiki to reach 100,000 articles. Hindi literature, music, and film have all been disseminated via the internet. In 2015, Google reported a 94% increase in Hindi-content consumption year-on-year, adding that 21% of users in India prefer content in Hindi. Hindi Divas – the official day to celebrate Hindi as a language. ^ "Scheduled Languages in descending order of speaker's strength - 2011" (PDF). Registrar General and Census Commissioner of India. 29 June 2018. ^ a b Hindustani (2005). Keith Brown (ed.). Encyclopedia of Language and Linguistics (2 ed.). Elsevier. ISBN 0-08-044299-4. ^ "The World Fact Book". Central Intelligence Agency. Archived from the original on 16 July 2017. ^ "Central Hindi Directorate: Introduction". Archived from the original on 4 May 2012. Retrieved 18 February 2014. ^ Hammarström, Harald; Forkel, Robert; Haspelmath, Martin, eds. (2017). "Hindi". Glottolog 3.0. Jena, Germany: Max Planck Institute for the Science of Human History. ^ "Constitution of India". Archived from the original on 2 April 2012. Retrieved 21 March 2012. ^ "Constitutional Provisions: Official Language Related Part-17 of The Constitution Of India". Department of Official Language, Government of India. Archived from the original on 13 January 2017. Retrieved 15 February 2017. ^ "PART A Languages specified in the Eighth Schedule (Scheduled Languages)". Archived from the original on 29 October 2013. ^ a b Khan, Saeed (25 January 2010). "There's no national language in India: Gujarat High Court". The Times of India. Ahmedabad: The Times Group. Archived from the original on 18 March 2014. Retrieved 5 May 2014. ^ a b "Hindi, not a national language: Court". The Hindu. Ahmedabad: Press Trust of India. 25 January 2010. Archived from the original on 4 July 2014. Retrieved 23 December 2014. ^ "How languages intersect in India". Hindustan Times. 22 November 2018. ^ "Hindi Diwas 2018: Hindi travelled to these five countries from India". 14 September 2018. ^ a b "Sequence of events with reference to official language of the Union". Archived from the original on 2 August 2011. ^ "Caribbean Languages and Caribbean Linguistics" (PDF). University of the West Indies Press. Archived from the original (PDF) on 20 December 2016. Retrieved 16 July 2016. ^ Richard K. Barz (8 May 2007). "The cultural significance of Hindi in Mauritius". South Asia: Journal of South Asian Studies. 3: 1–13. doi:10.1080/00856408008722995. ^ Mikael Parkvall, "Världens 100 största språk 2007" (The World's 100 Largest Languages in 2007), in Nationalencyklopedin. Asterisks mark the 2010 estimates Archived 11 November 2012 at the Wayback Machine for the top dozen languages. ^ "Hindustani". Columbia University Press. Archived from the original on 29 July 2017 – via encyclopedia.com. ^ Steingass, Francis Joseph (1892). A comprehensive Persian-English dictionary. London: Routledge & K. Paul. p. 1514. Retrieved 13 February 2018. ^ a b "Brief History of Hindi". Central Hindi Directorate. Archived from the original on 6 March 2014. Retrieved 21 March 2012. ^ "Rekhta: Poetry in Mixed Language, The Emergence of Khari Boli Literature in North India" (PDF). Columbia University. Archived (PDF) from the original on 28 March 2016. Retrieved 23 April 2018. ^ Paul R. Brass (2005). Language, Religion and Politics in North India. iUniverse, Incorporated. ISBN 9780595343942. ^ Clyne, Michael (24 May 2012). Pluricentric Languages: Differing Norms in Different Nations. Walter de Gruyter. ISBN 9783110888140. ^ Choudhry, Sujit; Khosla, Madhav; Mehta, Pratap Bhanu (12 May 2016). The Oxford Handbook of the Indian Constitution. Oxford University Press. ISBN 9780191058615. ^ Grewal, J. S. (8 October 1998). The Sikhs of the Punjab. Cambridge University Press. ISBN 9780521637640. ^ "हिन्दी दिवस विशेष: इनके प्रयास से मिला था हिन्दी को राजभाषा का दर्जा". Archived from the original on 11 September 2017. ^ "Hindi Diwas celebration: How it all began". The Indian Express. 14 September 2016. Archived from the original on 8 February 2017. Retrieved 7 February 2017. ^ "The Constitution of India" (PDF). Archived from the original (PDF) on 9 September 2014. ^ "Rajbhasha" (PDF) (in Hindi and English). india.gov.in. Archived from the original (PDF) on 31 January 2012. ^ "THE OFFICIAL LANGUAGES ACT, 1963 (AS AMENDED, 1967) (Act No. 19 of 1963)". Department of Official Language. Archived from the original on 16 December 2016. Retrieved 9 June 2016. ^ Roy, Anirban (28 February 2018). "Kamtapuri, Rajbanshi make it to list of official languages in". India Today. Archived from the original on 30 March 2018. Retrieved 16 March 2019. ^ "Gujarat High Court order". The Hindu. 25 January 2010. Archived from the original on 4 July 2014. ^ a b c "Hindi, Fiji". Ethnologue. Archived from the original on 11 February 2017. Retrieved 17 February 2017. ^ "Fiji Hindi alphabet, pronunciation and language". www.omniglot.com. Archived from the original on 8 June 2017. Retrieved 22 June 2017. ^ "Section 4 of Fiji Constitution". servat.unibe.ch. Archived from the original on 9 June 2009. Retrieved 3 May 2009. ^ "Constitution of Fiji". Official site of the Fijian Government. Archived from the original on 11 October 2016. Retrieved 14 October 2016. ^ "United States- Languages". Ethnologue. Archived from the original on 11 February 2017. Retrieved 17 February 2017. ^ "United Kingdom- Languages". Ethnologue. Archived from the original on 1 February 2017. Retrieved 17 February 2017. ^ "Hindi and Urdu are classified as literary registers of the same language". Archived from the original on 2 June 2016. ^ Sin, Sarah J. (2017). Bilingualism in Schools and Society: Language, Identity, and Policy, Second Edition. Routledge. ISBN 9781315535555. Retrieved 17 February 2018. ^ Arnold, David; Robb, Peter (2013). Institutions and Ideologies: A SOAS South Asia Reader. Routledge. p. 79. ISBN 9781136102349. ^ Bhatia, Tej K.; Ritchie, William C. (2006). The Handbook of Bilingualism. John Wiley and Sons. p. 789. ISBN 9780631227359. ^ D., S. (10 February 2011). "Arabic and Hindi". The Economist. The Economist. Archived from the original on 22 April 2016. Retrieved 13 April 2016. ^ "Stop outraging over Marathi – Hindi and English chauvinism is much worse in India". Archived from the original on 19 September 2015. ^ "Hindi content consumption on internet growing at 94%: Google". The Economic Times. 18 August 2015. Archived from the original on 15 February 2018. Retrieved 14 February 2018. Bhatia, Tej K. (11 September 2002). Colloquial Hindi: The Complete Course for Beginners. Taylor & Francis. ISBN 978-1-134-83534-8. Retrieved 19 July 2014. Grierson, G. A. Linguistic Survey of India Vol I-XI, Calcutta, 1928, ISBN 81-85395-27-6 (searchable database). Koul, Omkar N. (2008). Modern Hindi grammar (PDF). Springfield, VA: Dunwoody Press. ISBN 978-1-931546-06-5. Archived from the original (PDF) on 26 July 2014. Retrieved 19 July 2014. McGregor, R.S. (1995). Outline of Hindi grammar: With exercises (3. ed.). Oxford: Clarendon Pr. ISBN 978-0-19-870008-1. Retrieved 19 July 2014. Frawley, William (2003). International Encyclopedia of Linguistics: AAVE-Esparanto. Vol.1. Oxford University Press. p. 481. ISBN 978-0-195-13977-8. Parthasarathy, R.; Kumar, Swargesh (2012). Bihar Tourism: Retrospect and Prospect. Concept Publishing Company. p. 120. ISBN 978-8-180-69799-9. Masica, Colin (1991). The Indo-Aryan Languages. Cambridge: Cambridge University Press. ISBN 978-0-521-29944-2. Ohala, Manjari (1999). "Hindi". In International Phonetic Association (ed.). Handbook of the International Phonetic Association: a Guide to the Use of the International Phonetic Alphabet. Cambridge University Press. pp. 100–103. ISBN 978-0-521-63751-0. Sadana, Rashmi (2012). English Heart, Hindi Heartland: the Political Life of Literature in India. University of California Press. ISBN 978-0-520-26957-6. Retrieved 19 July 2014. Shapiro, Michael C. (2001). "Hindi". In Garry, Jane; Rubino, Carl (eds.). An encyclopedia of the world's major languages, past and present. New England Publishing Associates. pp. 305–309. Shapiro, Michael C. (2003). "Hindi". In Cardona, George; Jain, Dhanesh (eds.). The Indo-Aryan Languages. Routledge. pp. 250–285. ISBN 978-0-415-77294-5. Snell, Rupert; Weightman, Simon (1989). Teach Yourself Hindi (2003 ed.). McGraw-Hill. ISBN 978-0-07-142012-9. Taj, Afroz (2002) A door into Hindi. Retrieved 8 November 2005.